Invasion of alien plant species is a persuasive threat to the native plant diversity and caused habitat loss around the world. Invasions not only harm the native flora but have adverse impact on economic status as well as health of the country. A detailed study on allelopathy, allelochemicals and allelopathic mechanism of exotic invasive plants are reviewed. 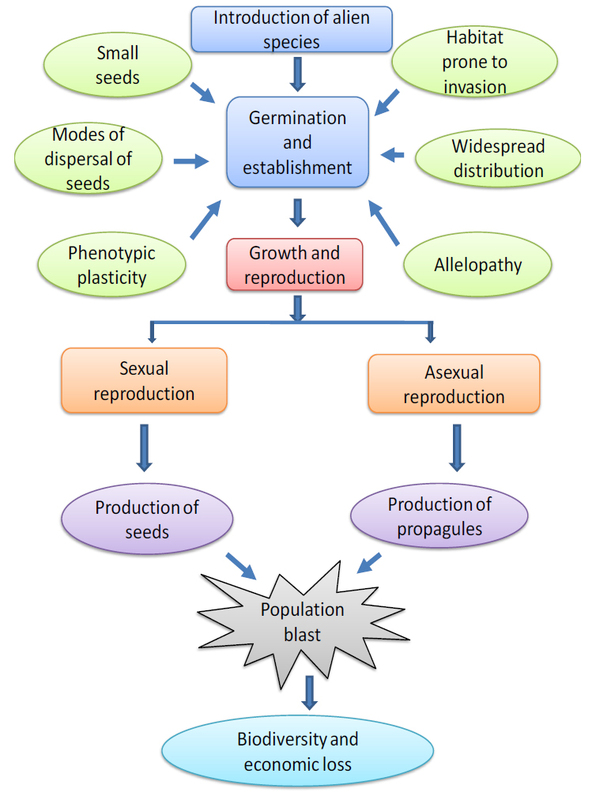 Main emphasis is given on the modes of invasion, reproductive characters, transmission modes, establishment, adaptability of weeds in the environment and the major exotic plants in India and their allelopathic effects on native vegetation. The allelopathy of most common exotic invasive plants in India such as Ageratum conyzoides, Eupatorium adenophorum, Parthenium hysterophorus, Lantana camara, Mikania micarantha, Argemone mexicana and Eichhornia crassipes has been described. Mechanical, chemical, biological and cultural control methods have been less effective individually, so integrated management with the participation of native people and proper land management have been proved beneficial. The various measures and management strategies to overcome and control the invasion of weeds have been discussed.